With Spring arriving the weather has been much warmer and drier and this has allowed me to travel further on the bike. 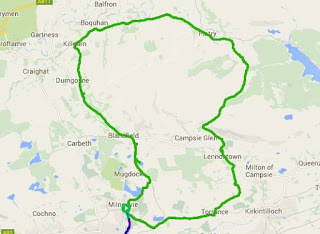 I recently cycled on a circular route from Milngavie which took me up the Crow Road to Fintry then on to Killearn and back to Milngavie. The distance was 39 miles. As Milngavie is quite a distance from my house I travelled by train to the start. The friends I was travelling with were boarding the train at Partick station in Glasgow. The weather was nice and sunny, if a little chilly. 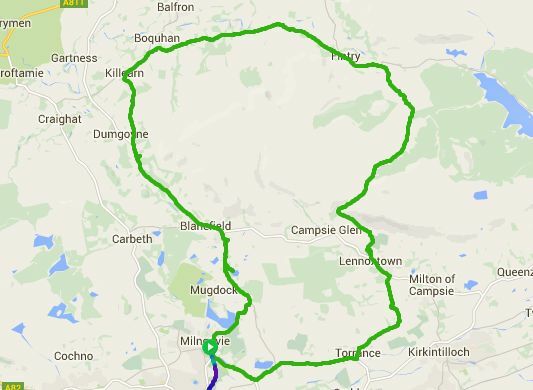 We were going to travel in an anti-clockwise direction from Milngavie to Torrance and then take the Campsie Road to Lennoxtown. This part of the ride was fairly flat. On leaving Milngavie we passed Murray Park, the training ground of Rangers Football Club. As it could be viewed from the roadside, I took a photograph of it. At the end of this road was a roundabout and we took the left turn onto Balmore Road. 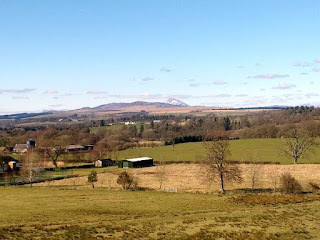 Shortly afterwards we arrived at the turn-off to Torrance and very soon the Campsie Fells could be seen in the distance. 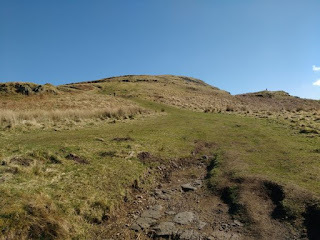 The flattish roads were soon going to give way to the steep climb of the Crow Road. 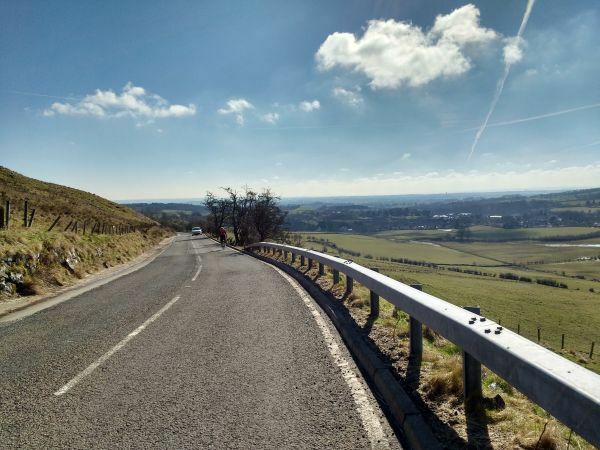 To get an idea of the gradient, think of a Pyrenean climb in Tour de France. It is such a steep hill. Arriving in Lennoxtown, we took the turning onto the Crow Road. The climb starts off quite gently before unleashing a torturous climb to the top. Not only is it extremely steep, it also seems to go on forever. Shortly after starting the climb, a car park comes into view and this is usually the place where hill walkers begin their walk over the Campsie Fells. It is at this point many riders start to think that the worst of the climb is over, but they soon find out that the summit is still a long way off. 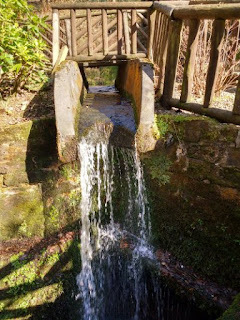 On Ordnance Survey maps there is mention of Jamie Wright's Well. On dragging myself up the hill, I spotted the well and as it was on a flattish part of the hill, I stopped to take a photograph. 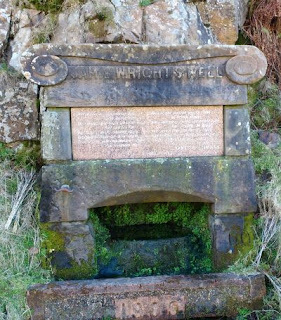 The well also has a tribute to James MacKintosh Slimmon (1865-1898) and his verses about the water at the well are inscribed on the front of it. As the water looked a bit dodgy, we refrained from filling our water bottles from it. The small break to take photographs of the well seemed to give me a 'wings' as I was able to climb to the top with less effort than at the start. At the top it was a nice descent to Fintry. The road surface on the descent, however, was dreadful - it looked like the council had thrown asphalt on the road and left the passing cars to flatten it as best they could. It was a bit dangerous and some care had to be taken to avoid a high speed crash. 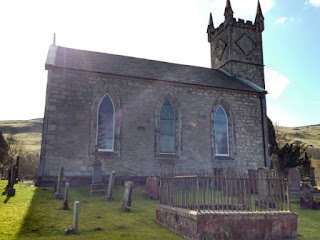 At Fintry we stopped to view Fintry Kirk. The original church was built in 1642 and the present one in 1823. Its windows are among the finest in Scotland and includes a First World War Memorial window. It also has one of only two cantilever staircases in the area. The bell was transferred from the original church to the new one and is still in use today. Arriving at Killearn, there were a number of bicycles parked outside the various cafes. We stopped at a one for a cup of tea and a cake and consumed them outside in the Spring sunshine, which was pleasantly warm. After our refreshment stop, we were going to embark on the final leg of the ride to Milngavie. However, it was not going to be a mad dash to the finish - we were going to stop at Glengoyne Distillery to look at the waterfall which carries the water from the hills to the distillery and at Loch Ardinning. 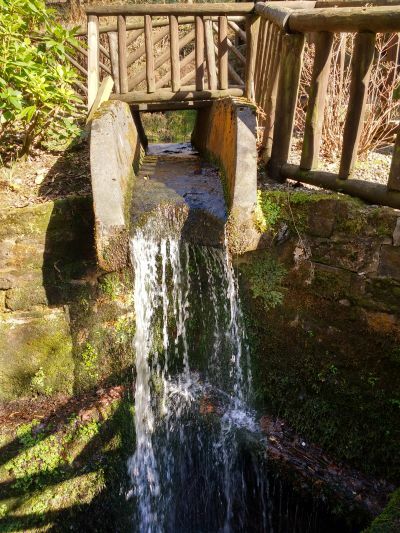 Glengoyne has been described as Scotland's most beautiful distillery due to it being situated under Dumgoyne Hill. The distillery is unique in that it is classed as a Highland Malt despite being matured in the Lowlands. 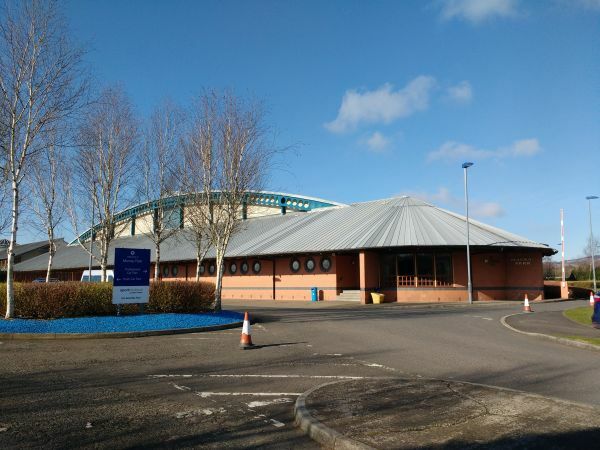 This is because the Highland Line, dividing the Highlands from the Lowlands, is located on the A81, which divides the main buildings of the distillery. 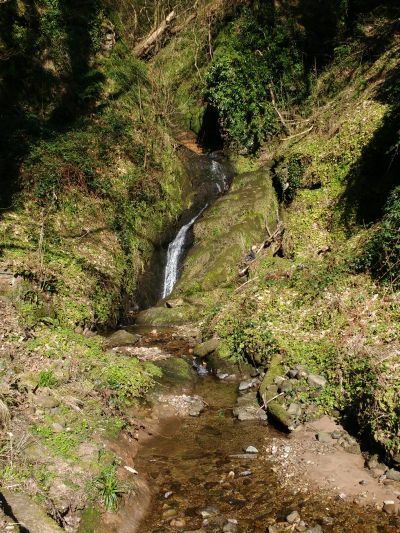 The waterfall, above, is located behind the main distilling area. It is a nice area to visit, with seating for visitors. 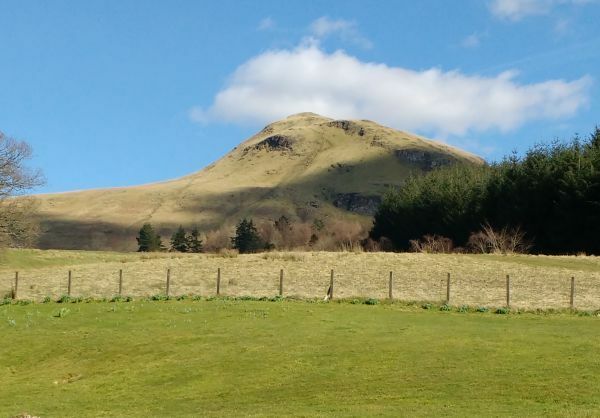 After viewing the waterfall at Glengoyne, we continued on the journey back to Milngavie. We were going to make one more detour, this time to Loch Ardinning. 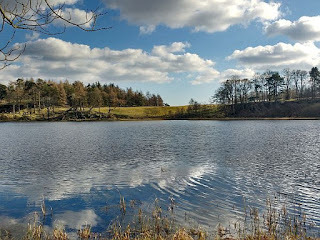 This is a nature reserve managed by the Scottish Wildlife Trust. The reserve is a mixture of wetland, woodland, grassland and moorland. There were some good paths around the reserve which were smooth enough to cycle on with road tyres. The reserve was quite busy and we decided to visit it in the summer when the loch comes alive with invertebrates and flowers. After leaving Loch Ardinning, it was a short cycle back to Milngavie station to catch the train home. It had been a great day out. 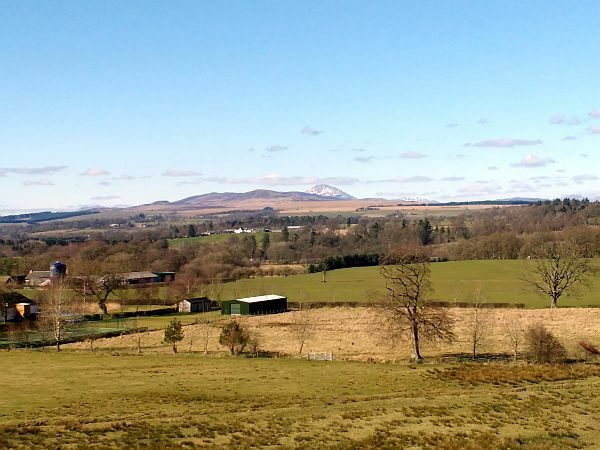 Milngavie has a regular train service from the Glasgow and the surrounding area. There is space on the trains for transporting bicycles.